Here is the cover. Two of the hardbacks arrived during the week. Beautiful, beautiful things, and they're printed in such a way that I've written an almost-500-page novel! I'm terribly impressed. You like? In the meantime, Abigail from Now magazine has received a copy of the David Fickling Books edition (YA), and says it was amazing—she read it in one gulp. "Phenomenal novel, Margo, thank you. I absolutely loved it"! And here is a lovely review from someone tipped off by Nymeth. This is a beautiful, complicated book, that I will definitely be buying in the future so that I can reread it to my heart’s content...I loved this book, because I thought it was wonderfully sweet and at the same time completely honest about the tragedies and scariness in any life. 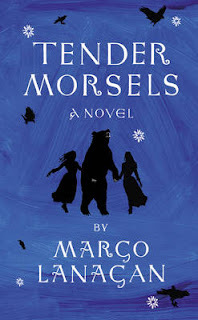 The ending was perfect, although completely not what I expected, which makes it just that much better...Tender Morsels is for anyone who has ever wanted to just hide under the covers instead of dealing with life. And for anyone who has had to overcome some horrible event in their past, going on to find hope and happiness. And for anyone who loves characters that feel like real people. And for anyone who adores beautiful prose. In other words, everyone should read this book. Soon. ...while I was down at the South Coast over the weekend. For Best Novel. Yee-haw! Also, 'The Goosle' won half a Ditmar—the other half was won by Dirk Flinthart, with whom I'm more than happy to share the honour and glory. All the details are over here. I drove home early this morning, through a wonderful dawn and hardly any traffic, to be at the Winter Writers' Lab at 10. Where I kept bashing my head against what seems to be turning into another brick wall of a story. Come on, story, liven up! Do something! And this, she says with some astonishment, will be my fourth winter blogging—who'd a thought I'd find so much to say? And still not have organised a website? Not working full-time—I have to say, I think it agrees with me. I've been fully occupied, no naps, no slacking. A nice social lunch planned today, but that's the first, truly! I have 10 pages towards the first short story of 2 that I owe people this month. I've also put an afternoon's research towards it (and photocopied a swag of material for novel research too), at the State Library. I've used my writing room both days. Once for doing Pilates, once for actual writing (the 10 pages). I've judged a pile of manuscripts for the Vogel. Oh my goodness, it's scary, the number of people who are out there penning novels. As with all judging and editing, the longlistable ones announce themselves very clearly and calmly. It's ploughing through the unindented paragraphs and howlers of the others, to give them a fair hearing, that's the hard bit. Actually, the big problem with a lot of them—and I remember, this was the problem with my Vogel entry back in, ooh, that'd be 1988—is absence of forward momentum, absence of story, absence of point. The idea that if you fill 200 pages with words, that must be a novel. Oh ho, but it's not, people. Today I have to check what I sent to the accountant for the tax return, which apparently doesn't add up, and write some story, and write a bunch of publicity for 2 different websites. Also do lunch, if possible without too much wine, so that in the afternoon I can, oh I don't know, find a cure for cancer? Take over the world?